- Enjoy a compact, well-proportioned design with smooth surfaces, exclusive materials, and a high-quality slider. - Capture images and video with a 3.2 megapixel camera and admire your work on a 2.2” TFT QVGA display. - Listen to your music or the radio on the move with a multi-standard music player and an integrated FM radio. - Share images, videos, or other media with USB-on-the-go, Bluetooth, or GPRS. - Find your way with Nokia Maps. 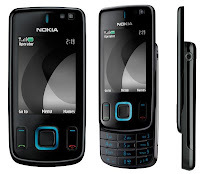 - Nokia Xpress Audio Messaging: record your own voice message and send it to compatible devices. - Tap commands: mute and reject calls, or silence alarm.